Barry Swenson Builder, the firm developing the new Aptos Village, today announced that the Hihn Apple Barn is moving in early 2016. The firm is reporting that it’s in the final planning stages of moving the historic barn to a new and central location on the property, about 300 feet west of its current location. The Santa Cruz County Board of Supervisors approved the final subdivision maps for the mixed-use development during a meeting this past December 8th. Work to relocate the Hihn Apple Barn will begin in early 2016. The historic apple packing facility will be converted into a modern grocery store, and will include exhibits highlighting prominent historic features of the structure and interpretive signage that will illustrate the history of the barn and its Aptos Village setting. Village Fair, the antique collective in the Hihn Apple Barn, will remain open through the holiday season. 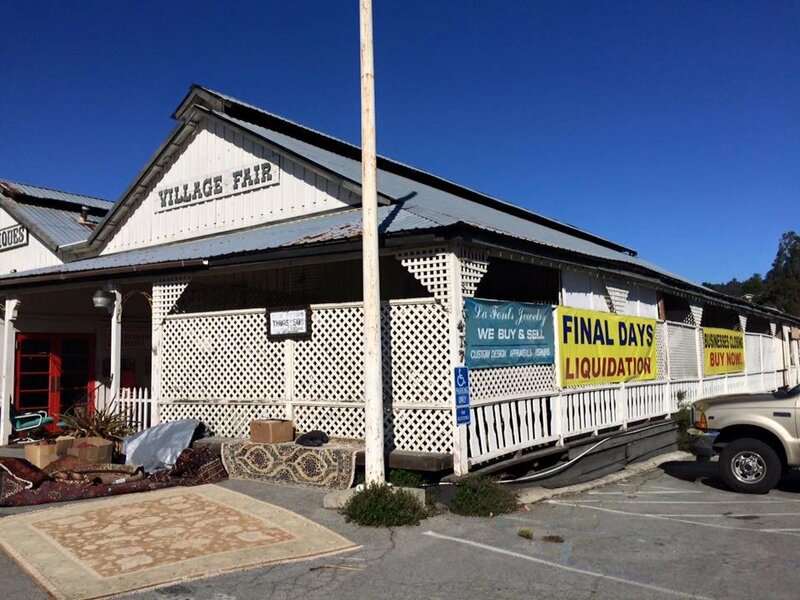 Friends and neighbors will be interested to hear that a few antique dealers who rent space at Village Fair have expressed interest in one day opening shops in the revamped Aptos Village. Apple trees were planted in Aptos after the logging industry decimated the Valencia Creek Watershed. The Hihn Apple Packing Plant was built by Frederick Augustus “FA” Hihn in the early 1890s and became the center of the apple industry in Aptos for decades. 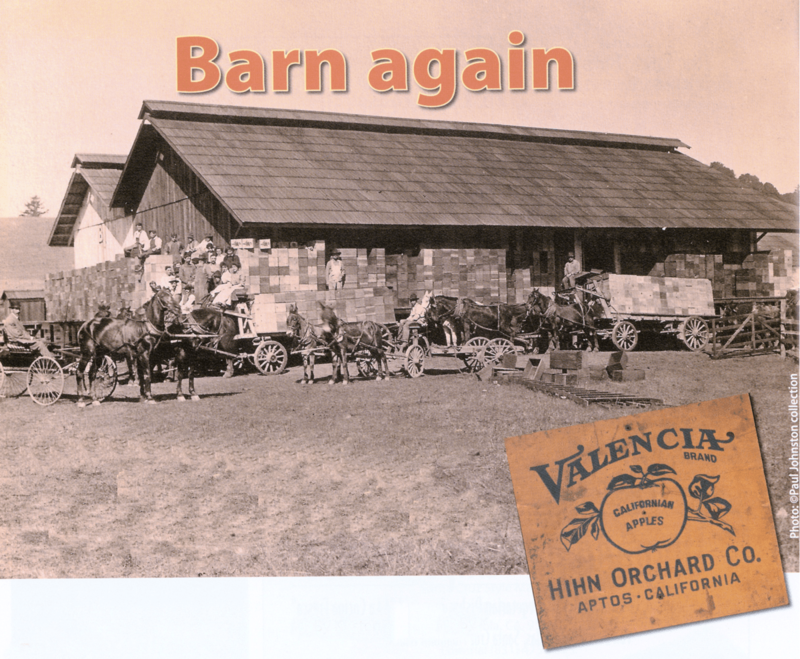 Hihn saw the growth of the apple industry in the Pajaro Valley. He hired former lumberjacks to plant apple trees on the logged-out land and offered the lumberjacks an opportunity to buy their own parcel of apple orchard on a 10-year payment plan. Once established, the orchards provided a myriad of jobs. People were needed to pick, grade, sort and pack the apples. Well-shaped and unblemished ripe fruit was given the classification of “fancy,” then sorted by size and shipped to be sold fresh. “Good” apples, which were not attractive, were sent to be dehydrated for cooking because refrigerated shipping had yet to be invented. Rejected apples and remains from the dehydration process were combined and converted into cider and vinegar. Converting a portion of his 27 acres to apple orchards was a shrewd business decision for Hihn. He made a profit selling orchard land and built a small subdivision on another portion of his land so workers could be housed. Hihn also owned the railroad, and growers paid Hihn to use it to transport apples to town. Santa Cruz County’s first self-made millionaire, Hihn died in 1913 at age 84. By then, the Apple Barn had changed hands several times and the industry was waning. In 1944 “Babe” and Fred Toney bought the Bay View Hotel, the Apple Barn and surrounding land. Babe started a small gift and antique concession at the hotel. In 1965 she moved her shop over to the Apple Barn and Fred divided the building up into individual stalls to attract in other businesses. They called it “Village Fair” and soon had new antique dealers and gift sellers, as well meat and produce vendors. The Toneys died in a car accident in 1979, but their daughters continued to run Village Fair for nearly three decades. The Toney daughters sold the property to Barry Swenson Builder in 2007 for the new Aptos Village project.